By V Renée, NoFilmSchool: Attention everyone: We have found it. We have found the Holy Grail of online screenwriting/storytelling resources. If you’re a screenwriter and/or a complete glutton for geeking out, you need to stop what you’re doing immediately and check out Design Through Storytelling’s Periodic Table of Storytelling, which — is exactly what it sounds like — a collection of story tropes organized by purpose and name, all of which are clickable links that take you to their own TV Tropes wiki page. Sometimes you find things during your internet adventures that make your heart swell with appreciation and nerdy delight for the glory of cyberspace. This is by far one of the coolest things I’ve ever found — and it doesn’t hurt that its an incredibly helpful compendium of storytelling knowledge that is easier (and more fun) to navigate that flipping back to the table of contents in a screenwriting book. 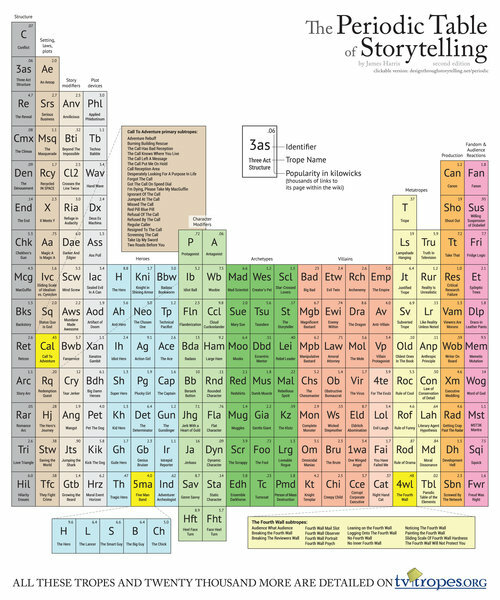 Created by artist James Harris, The Periodic Table of Storytelling is designed just like the tabular arrangement of the chemical elements, except instead of being organized in groups of alkali metals and noble gases, you’ve got plot devices and archetypes. Harris included everything, like the different villain and hero archetypes, character modifiers, story structure, and setting/laws/plots. Every story element square is clickable and takes you to its wiki page on TV Tropes, which explains the trope in detail. And if that’s not enough, Harris includes 10 “simple story molecules” that can be formed when you combine certain story elements. So, if you’re a science nerd (redundant) and a screenwriter, you’ll just be in absolute heaven when you start playing around with this. You can check out the Periodic Table of Storytelling by clicking here. And, as an added bonus, you can order your own Table poster for about $30. What do you think of the Table? Are there any tropes that you wish would’ve been included? Let us know in the comments below. Is Hollywood screenwriting success easier to find online?